North Atlantic Treaty Organisation (NATO) Secretary General Jens Stoltenberg said that while Russia does not pose an imminent threat to any NATO ally - namely the countries in the eastern part of the Alliance - it has become more assertive and wants to spread its influence in its neighbouring countries. The Secretary General made this comment while he delivered a speech at an event hosted by the Atlantic Council in Washington on April 6. “Russia under President Vladimir Putin, in an attempt to re-establish a sphere of influence around its borders, is willing to use military force…to intimidate neighbours, to change borders in Europe, annex Crimea, destabilize eastern Ukraine, and having troops in Georgia and Moldova and so on,” he added. Moreover, he stated that in response to Russia’s 2014 annexation of Crimea and subsequent support for separatists in eastern Ukraine, NATO has become “more agile and better prepared,” and its Response Force is three times bigger. 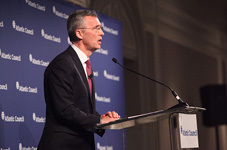 “Without NATO, transatlantic cooperation would be weaker, Europe and North America less safe, and the world a more dangerous place.” Stated Stoltenberg, and underlined the importance of the Alliance. However, he noted, NATO is not seeking a confrontation with Russia. “We will avoid a new Cold War,” he said, adding that NATO is striving toward a more cooperative relationship with Russia, but it has to be firm to establish the basis for political dialogue. Stoltenberg, a former Norwegian Prime Minister, said there was no contradiction between strong defence and political dialogue. “For me, dialogue is not an expression of weakness, it is an expression of strength,” he said. “In the long run, Russia has to understand that they will gain more from cooperating with us instead of confronting us,” he added. According to the Secretary General, NATO is building its capacity and training troops in Afghanistan, Georgia, Moldova, and Jordan. It will soon provide counterterrorism advice to Tunisia and help improve the capacity of its armed forces. At the Atlantic Council event, Stoltenberg also talked about the priorities of NATO, terrorism, the Warsaw Summit and NATO regional partners.